In 1983 Jimmy John Liautaud began his gourmet sandwich business. Jimmy John started with cookbooks and family taste tests. He opened his first sandwich shop with a used refrigerator, chest freezer, oven, and meat slicer. The business served ice free soda – there was not enough money in the budget for an ice machine. The enterprising 19 year old took to the streets with free sandwiches. Jimmy John’s sandwiches quickly became popular, especially with college students, who enjoyed the cheap prices and imaginative recipes. As a business, Jimmy John's has grown up over the last few decades. The irreverent attitude, low price, great food and delivery with a smile remain the same, but what was once the bratty little brother of the sandwich industry is now the super cool older brother that everyone else wants to be. Jimmy John’s now has over 1600 stores. 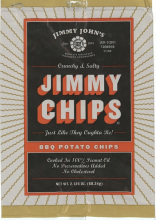 Jimmy John’s also manufactures its own Potato Chips to serve with its sandwiches.